After an extremely long drive from San Francisco (note to self: don’t try and leave at rush hour because it will take you over an hour to get just get out of the city) we arrived at our hotel around 10pm. As it was late at night we couldn’t really see much of what was around us so we just picked up our keys and headed off to our room for the next two nights. 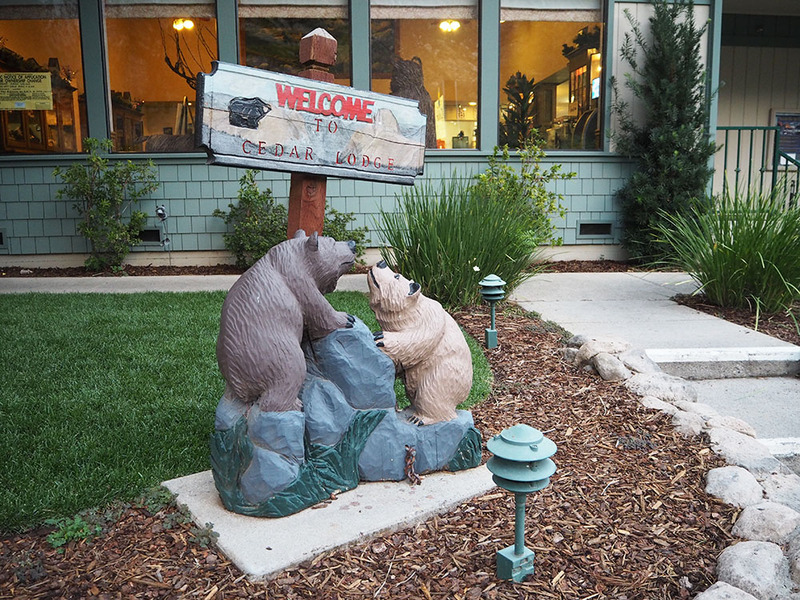 We stayed at the Cedar Lodge in El Portal just on the outskirts of Yosemite National Park. 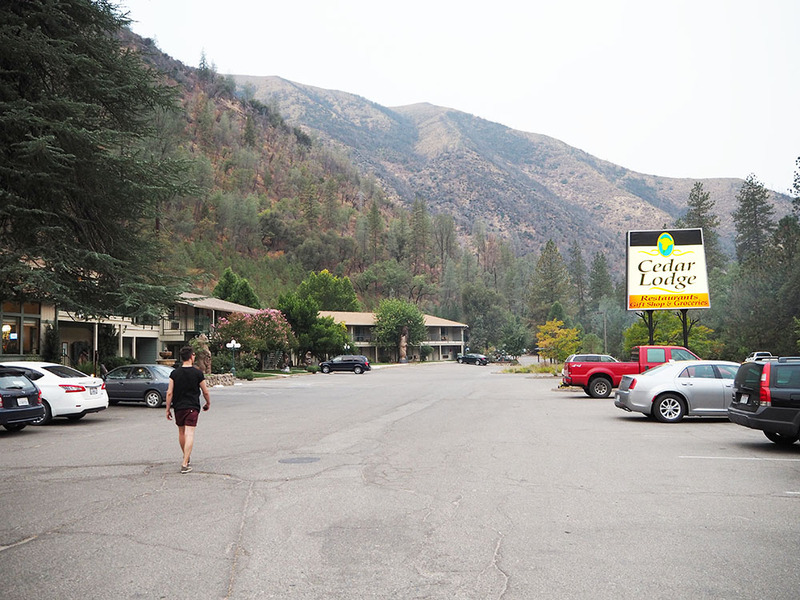 There aren’t that many hotels actually in the park itself, but this one is only around half an hour from the main centre of Yosemite Village in the park so it was in a pretty good location. When we got up in the morning and were able to see outside we realised how beautiful our surroundings already were, which made us super excited for the upcoming day in the park itself. To get into the park you do have to pay an entry fee which is $30 but that gives you access for 7 days, so if you’re sticking around for a week you can continue to use it everyday. 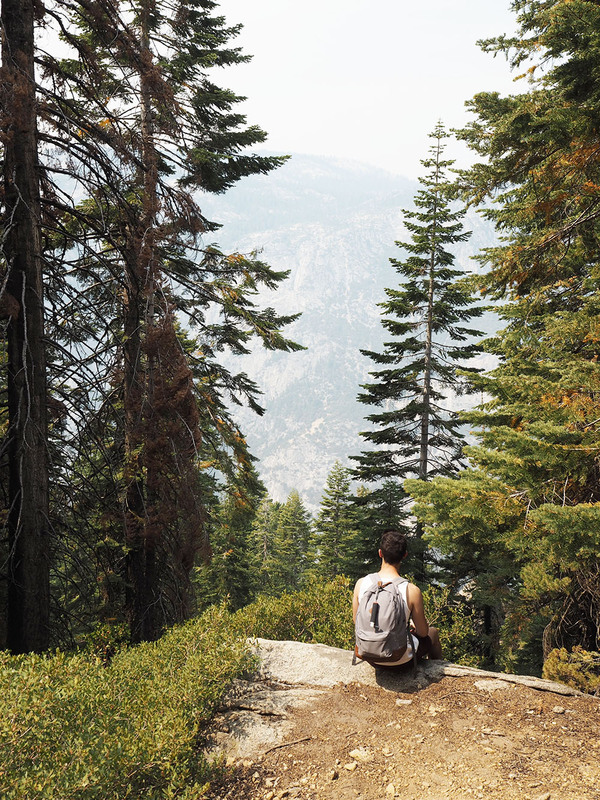 I did so much reading before we left about what things to do in Yosemite and there was literally so much I wanted to fit it but we only had one full day and then however much of the second day we wanted to spend in Yosemite before leaving for our next hotel. So we really had to condense down our plans. 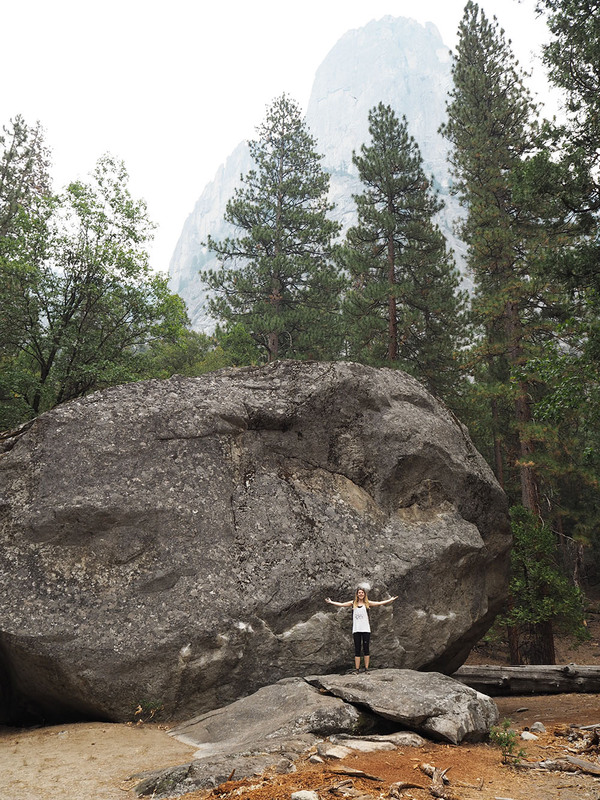 A couple of things we wanted to do but couldn’t was rafting down the river (the water level was too low so it was over for the season), and visiting the giant sequoia trees in Mariposa Grove (the area is closed until 2017 for refurbishment). The websites I found really helpful were this one, this one and this one. These helped me plan what things we could do and see while we were there. 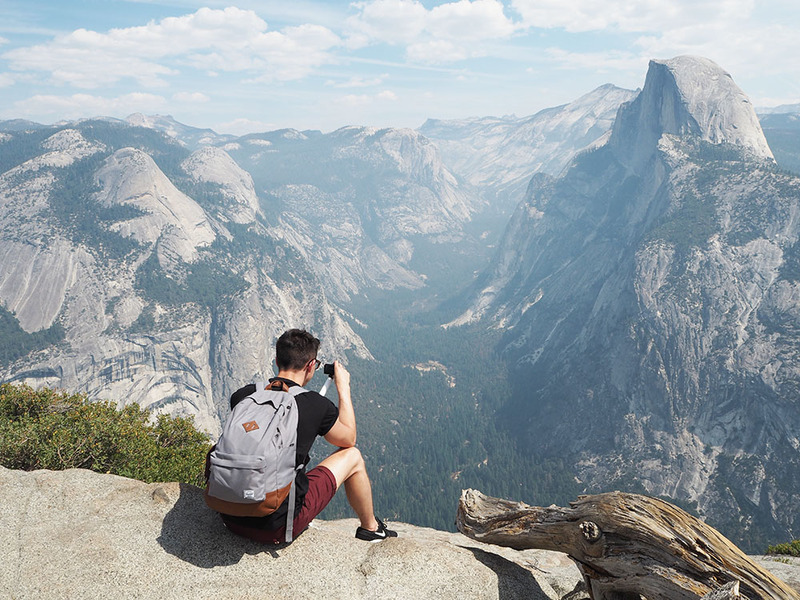 One of the top things that was mentioned was Glacier Point, from where you have an awesome view of the famous Half Dome. 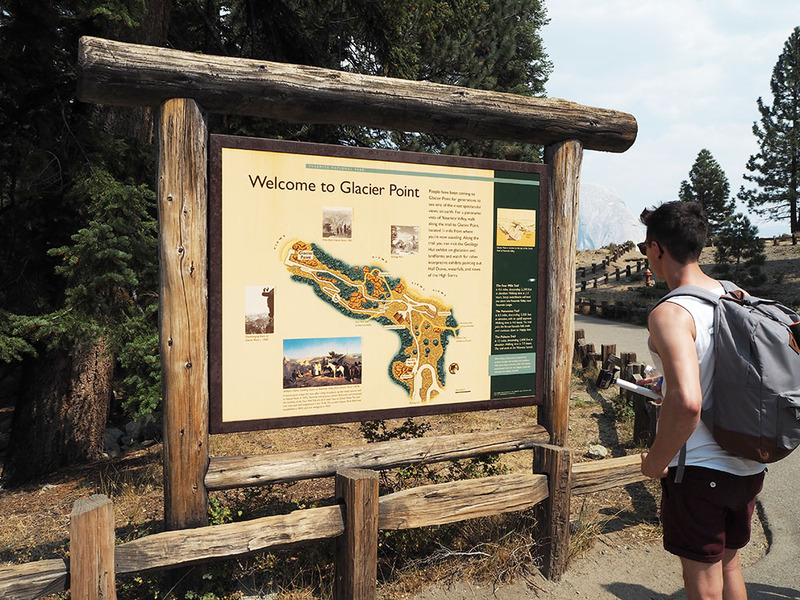 I then found that you could hike up to and down from Glacier Point using a number of different hiking routes, the main two being 4 Mile Trail and the Panorama Trail. 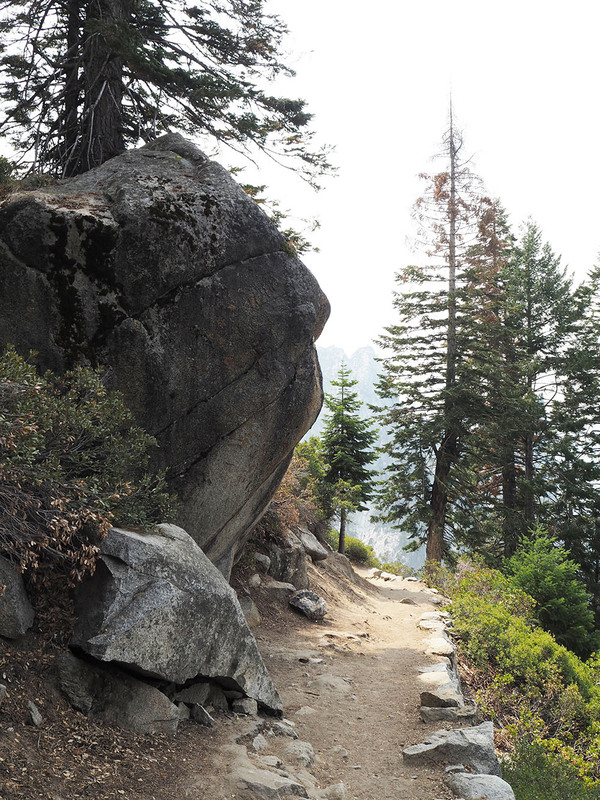 There is also another trail you can take called the Pohono Trail but at 13 miles and 7-9 hours walking time, I didn’t look into that one, but it could be the one for you if you’re a keen hiker! 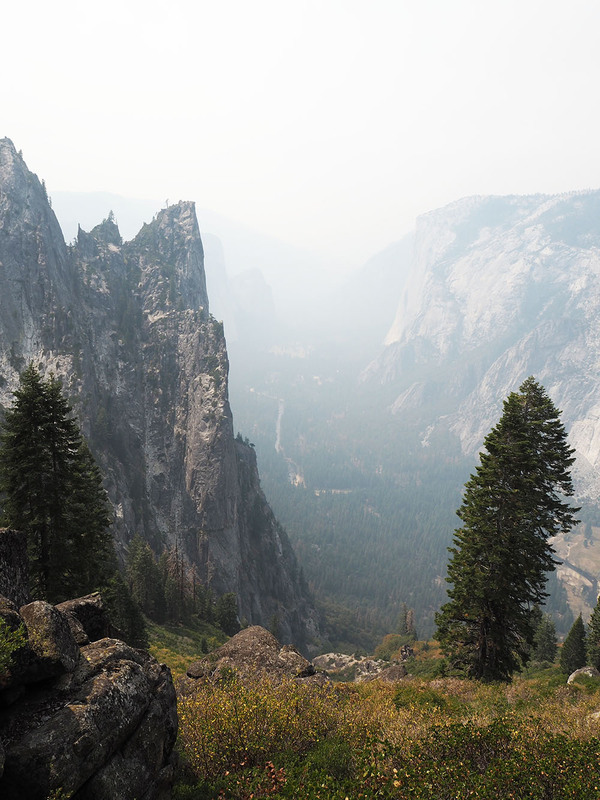 I also found that you could travel by coach to and from Glacier Point, find out more about it here. 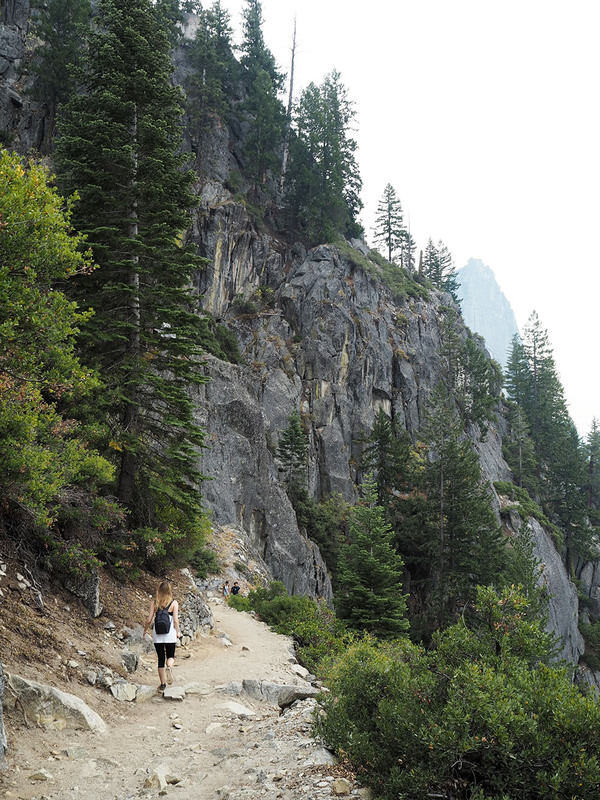 You can either choose a return trip or a one-way and hike your way down. 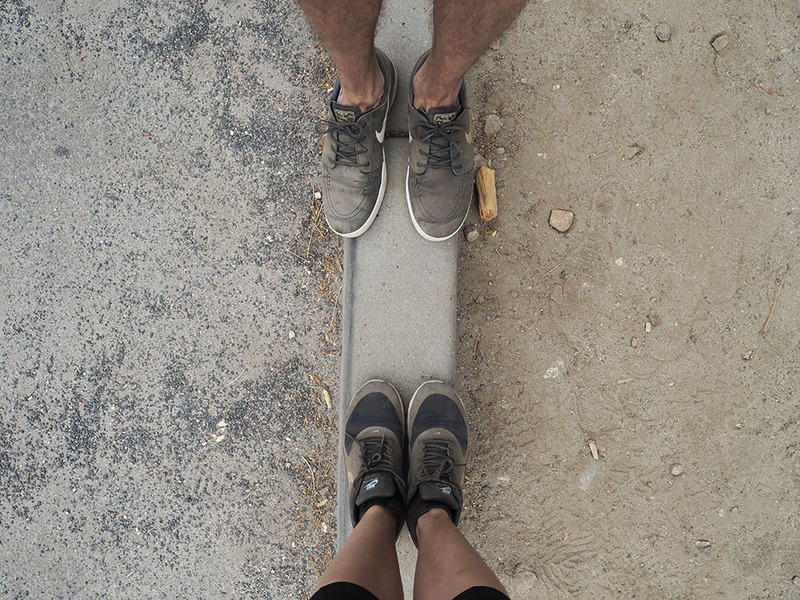 Let me just say now, me and Luke are not hikers, or have ever done anything like this before so it was a bit of a big deal to us to commit to something like this on our own without any guidance. Just in case some seasoned hikers think it’s no big deal really. Deciding that we needed to adventure as much as possible we booked a one-way with the intention of hiking down. I looked into the two main trails so I knew roughly what to expect when we had to choose between the two. After parking our car and running like crazy people to catch the coach in Yosemite Village, we wound our way up towards Glacier Point. While we were on our way we started to doubt whether hiking was actually such a great idea and asked about getting the coach back down and paying for a return trip. While the coach driver said we could if we really wanted to, he advised us to try hiking to really see the most of the park. So we hopped off the bus and had an hour to make up our minds about what to do. 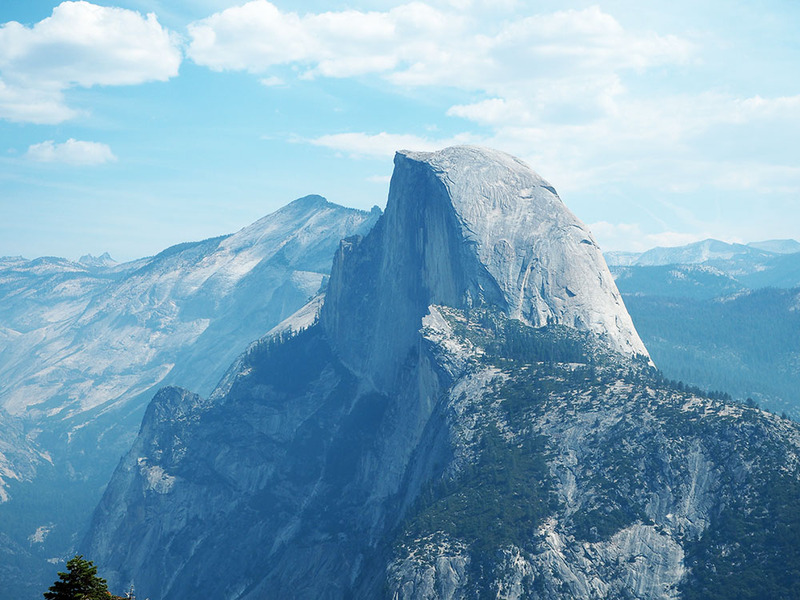 Once we got out and walked around the viewing area for Half Dome we were literally awestruck with the beauty of Yosemite. I literally can’t explain it, and these photos can’t quite even begin to convey it. It just makes you feel so insignificant and tiny. I could have stayed there all day. 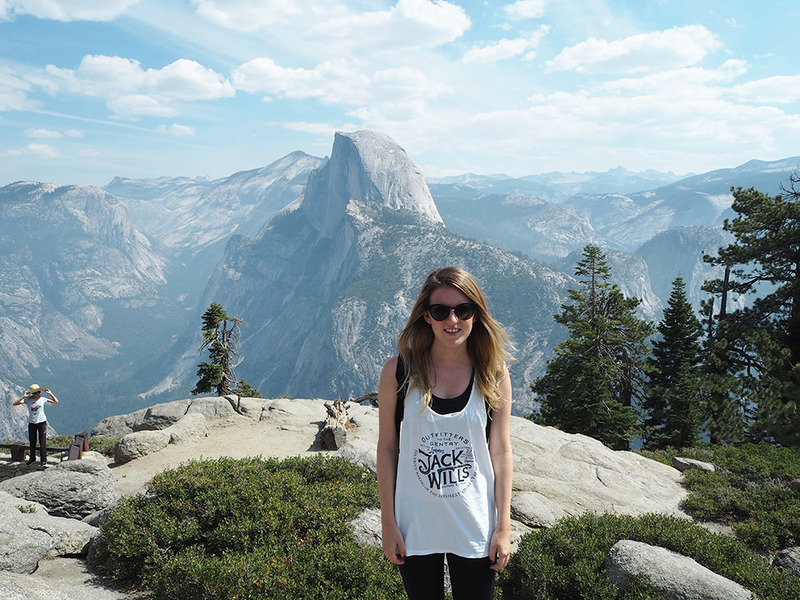 We were told Half Dome (the thing just behind my head) either looks like a wizard’s face or a dolphin, I’m definitely going with a face. Now you would definitely not be catching me sitting on the edge like that. Even going near him gave my legs the wobbles! After pondering over our options obviously we decided to hike down, we couldn’t not do it really could we?! We decided to ease ourselves in with the Four Mile Trail, a 4.6 mile relatively easy hike down that would take 2-3 hours. 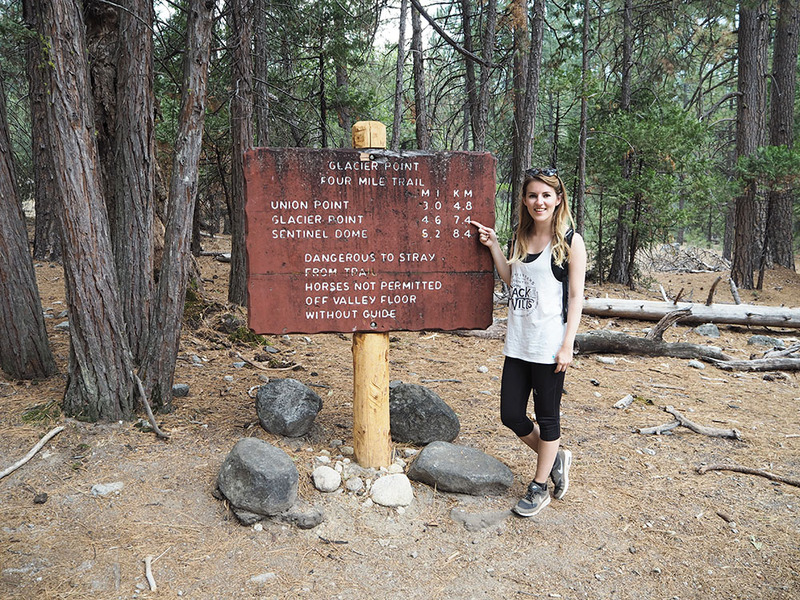 While I did want to do the Panorama Trail it would have taken us 5-6 hours, and as we haven’t done anything like this before we weren’t sure if we were quite ready for that commitment! Definitely on my list for next time though, because there will 100% be another visit to this gorgeous place. 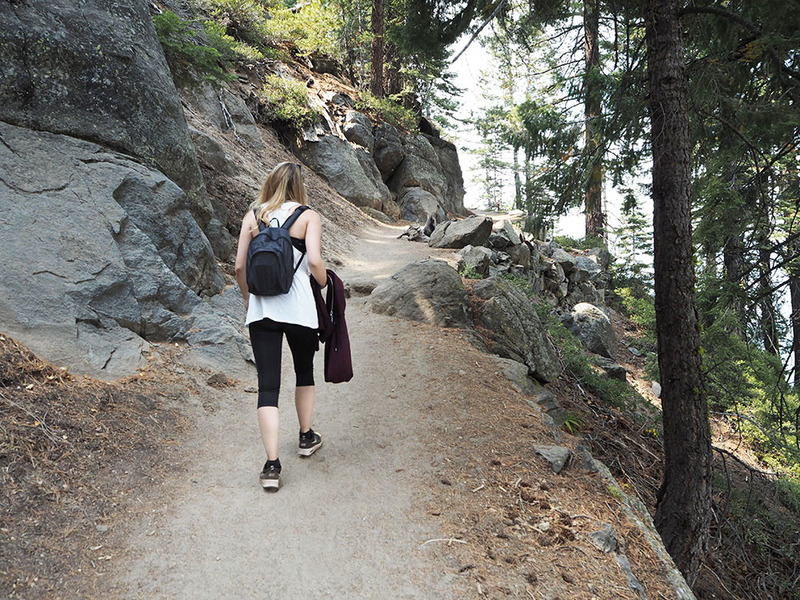 We headed to the shop at Glacier Point first and loaded up on the essentials in case of emergency (2 giant cookies, a muffin, a bag of Cheetos and 2 bottles of water). We also naively asked if we needed a map or anything but were assured that the trail would be clear to see, (it completely was, so no worries there!). Then we head off into the woods in front of us on probably my favourite adventure of the entire trip. As we aren’t professionals (and only had a 23kg luggage allowance) we didn’t pack any fancy hiking gear. I just wore sports leggings, a sports bra, a loose t-shirt and Nike Air Max Theas. We were initially worried we might be under-dressed as some people came past us in full hiking gear and poles! But after a girl went past us in a crop top, Levi shorts, Converse and no bag with any supplies, we figured we’d be ok.
All I can tell you is the views on the way down were incredible. It took us the full 3 hours because we kept stopping every 5 minutes to take photos and video. It’s so beautiful there. Unfortunately it was slightly fogged over and smoky (due to the fires going on at the time) so you can’t fully see the scale of the landscapes into the distance as much as we could IRL. On a clear day it must be even more insane. The ground we walked on varied really, from more muddy to mostly rocks and dusty track. At some points I did almost lose my footing but you just have to be careful where you’re walking. There are also some very sheer drops with nothing to stop you going over them so you do have to be aware of your surroundings. That being said it was a relatively easy route to walk. I don’t think it would be the same story going up however. Towards the end of it, our feet and legs were aching rather a lot from the action of walking downhill for 3 hours. I would just like to point out though that for once, Luke was actually complaining more about it than me. I’m clearly harder than him. When we finally reached the bottom we were so pleased with ourselves. I do feel that it was a massive achievement because I’ve never done anything like this before. And I would 150% do it again, maybe even uphill! Safe to say our shoes and legs were a little dusty. That’s the mark of a proper adventure. To get around Yosemite they have free shuttles, and a shuttle stop just on the road near the end of the trail. While we could have walked back to the main Yosemite Village where we had left our car, we didn’t really know where we were going so we opted for the shuttle. I think they come every 20-30 minutes in September when we were there. After getting back into the main village we had a little wander around, bought some snacks in the shop and had a couple of yummy burgers for dinner, before heading back to the car and to our hotel. This day gave me just a taster of what Yosemite could offer and I definitely want some more! I’ve got one more day in this wonderful place so that post should be up very soon if you fancy seeing what else we got up to in Yosemite!